Santa Clarita plays host to one of America’s most popular bicycle races. For many, bicycling is a hobby that ranges from a light, lazy ride along the streets of your neighborhood to perhaps spending a day on longer treks with friends andAMGEN Tour returns to Santa Claritafamily. For others, it’s a way of life. 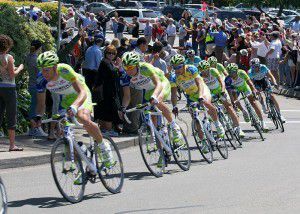 The AMGEN Tour of California hosts an annual race that takes riders along some of the most scenic sites in our state. This year once again, the race takes a tour through Santa Clarita. Known as America’s most successful cycling race, this is one of California is one of the nation’s largest and most recognized annual sporting events. for eight days, this bicycling road race combines professional teams and athletes from around the world. Now in its ninth year, AMGEN once again takes center stage in the SCV for the sixth time. This year’s race will feature 16 world class cycling teams riding across more than 720 miles in California. Stages 6 and 7 will take place beginning Friday, May 16th and continue through Saturday. Stage 6 will begin in Old Town Newhall, initiating a 94 mile to Mountain High, ending at 11,700 feet. Stage 7 will commence Saturday at the Westfield Valencia Town Center for an 88 mile trek that winds its way to its final destination in Pasadena. AMGEM is presented by Crunchies Natural Snacks. Riders will also be supported by the national initiative Breakaway From Cancer, honoring cancer survivors from tour communities throughout the race. Hard closures during the Stage 6 event on Friday will affect Main Street at Lyons Avenue at approximately 11:35AM as riders prepare for departure. Closures are expected to last through the afternoon. Saturday’s Stage 7 event will affect traffic along McBean Parkway around the Westfield Valencia Town Center, with northbound lanes being closed, as well as westbound lanes along Newhall Ranch Road 10 to 15 minutes before the start of the race, which is expected to begin at around 11:40AM. More AMGEN information, routes, and real time “Tour Tracker” updates can be found by clicking here.